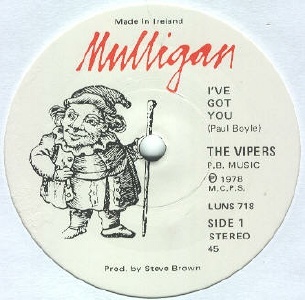 The Vipers were formed in 1977 by Paul Boyle and Dave Moloney with original members Ray Ellis (gtr) and Paul Cusack (bass). Dave Moloney had been playing drums since 1974-75. He'd temporarily replaced Simon Crowe in the Boomtown Rats for a couple of months before Crowe returned, during which time he'd reheased with them but not played out. He was next in Slick Coupe & the Convertibles. Paul Boyle had spent six months in jazz-rock outfit No Buckets (who also spawned Trevor Knight of Auto Da Fe), a pub rock band called Starwalker and various garage bands with Paul Cusack, including Tumbling Dice. Some say Ray Ellis wasn't a full-time member but was only drafted for gigs. 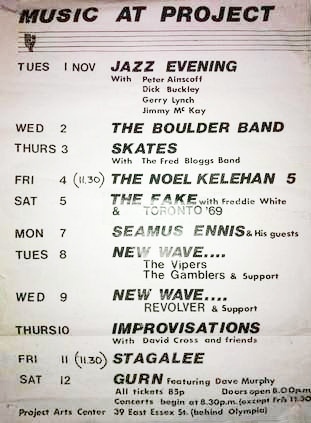 Their debut gig was the Belfield Punk Festival (at UCD) in the summer of 1977, which was organised by The Radiators from Space and also featured The Undertones, Revolver and The Gamblers. A fight broke out during the opening band's set and and one member of the audience was stabbed. He later died in hospital. This event generated a lot of bad press for punk in Ireland. Their second gig was again supporting The Radiators from Space, this time at Moran's Hotel. The Vipers quickly built up a following at Dublin's Magnet Bar with an exciting mix of punk rock and Kinks-inspired rhythm and blues. Their set included covers like "Till The End of the Day" (The Kinks), "Pool Hall Richard" (The Faces), "Teenage Depression" (Eddie & the Hot Rods), and originals like "Strut It", "Too Tough" and "You Had Your Chance". Ray Ellis was ejected and Boyle took over all guitar duties. Boyle became an articulate spokesman for the developing Dublin punk scene. Cusack left in late 1977 to be replaced by Ivor Rowan. 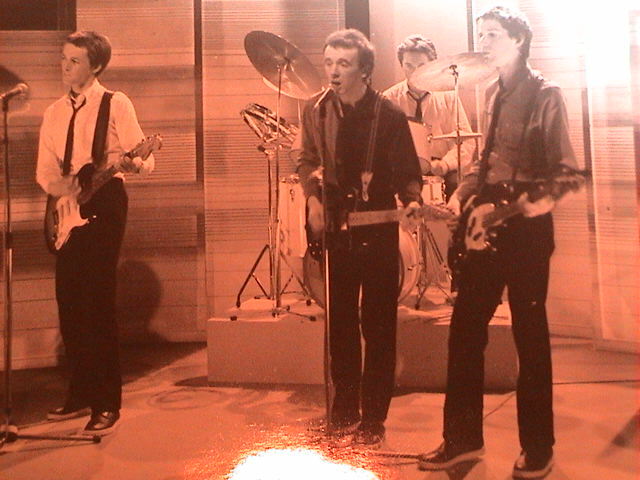 The band provided able support to the Clash on their second Irish visit and continued to garner wide local press coverage especially when rural gigs were cancelled in the wake of a media backlash following the incident at Belfield which was unrelated to the band or its followers..
above: The Vipers first lineup appearing on RTE's Our Times in 1977. 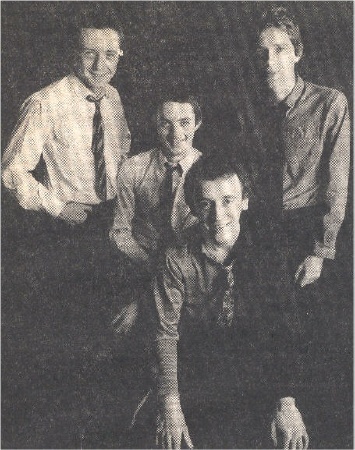 Initial promise evidenced by the band's first demo tape having evaporated by early 1978, Boyle and Moloney decided to relaunch the band and recruited George Sweeney, a founder member of Dublin's Rocky de Valera and the Gravediggers on lead guitar in July 1978. Sweeney had originally played with Adam Clayton in the Max Quad Band. Brian 'Dolan' Foley late of London punks the Gremlins followed in August on bass. 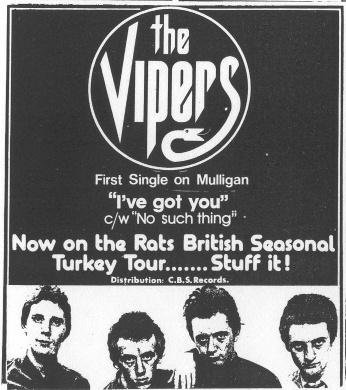 After intensive rehearsals the Vipers resumed gigging and were immediately signed to Mulligan Records and recruited as support act on the Boomtown Rats UK 1978 Christmas tour. 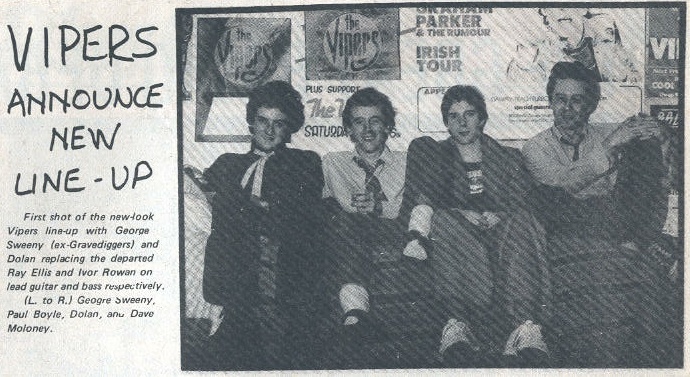 These gigs and an Irish mini tour with the Jam built momentum for the release of the single 'I've Got You/No Such Thing' with Paul Weller endorsing the release and band in several UK press interviews whilst Sounds magazine chose the record as 'single of the week' in December 1978. 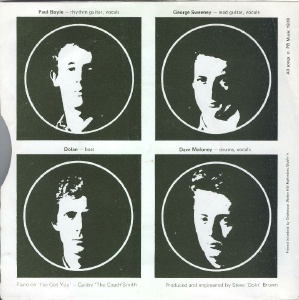 The piano on the single was played by Gaby Smyth (see also The Reasons). 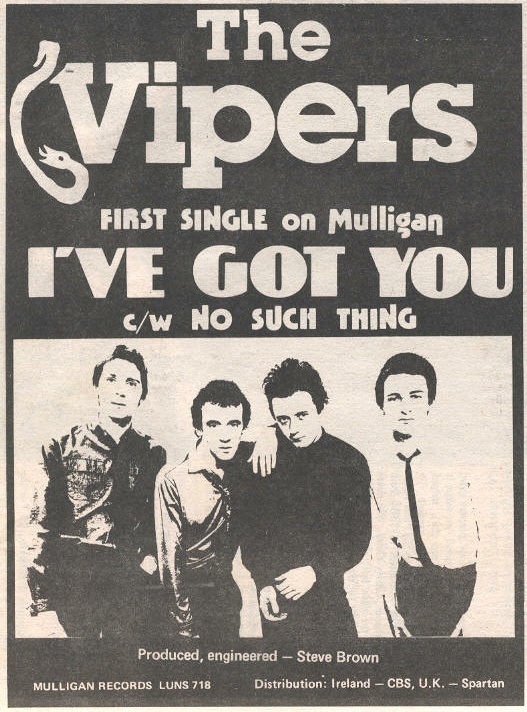 above: The Vipers second lineup announced in press, September 1978. The Vipers returned to active gigging with new drummer Bernie Smirnoff in September 1979 at the Bridge House in Canning Town, East London. 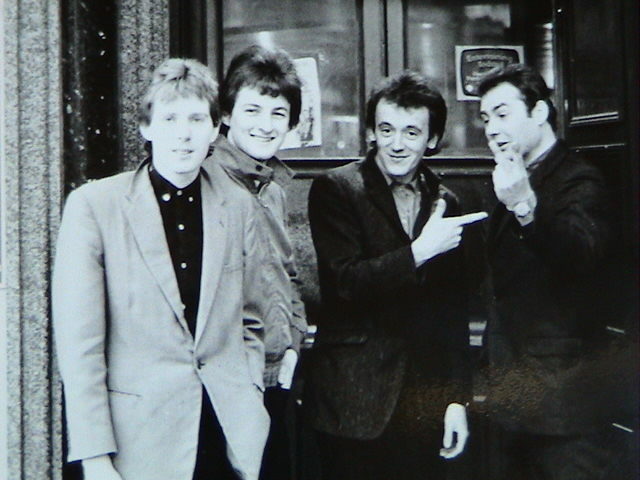 The Smirnoff- era band recorded further tracks for Mulligan in early 1980 and as a result were slated to sign with the Roxy Music-owned EG Records later that year. 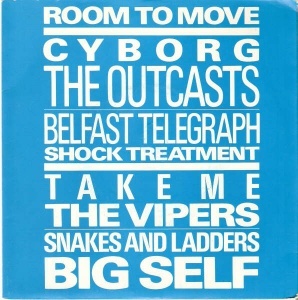 Ultimately departure of key personnel at EG led to the Vipers releasing only one song 'Take Me' on the EG-subsiduary Energy Records (on the 'Room to Move' EP) and the shelving of the planned deal. 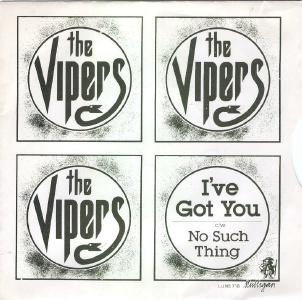 Although successful gigs at London's Hope and Anchor and Electric Ballroom followed, the Vipers never regained their initial momentum. Brian Foley and George Sweeney decided to leave at Christmas 1980 returning to Dublin, Foley to The Blades and Sweeney to Red Square. Paul Boyle later turned to acting. George Sweeney was later in Red Square and The Fat Lady Sings. Brian Foley was later in The Blades. 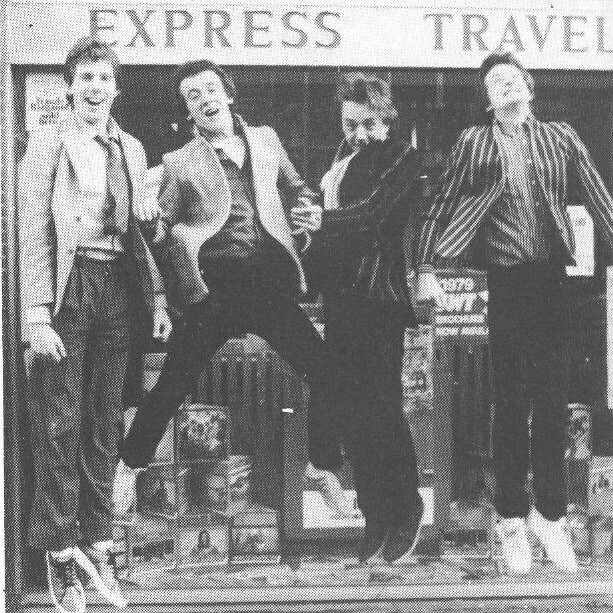 Dave Moloney toured with Johnny Logan's band following his eurovision win and later turned up in The Reasons (1979), The Rhythm Kings (1982), Flash Harrys (1983), G Squad (1985), Fast Boys (1986), Wilf Brothers (80s) and Paul Cleary's Cajun Kings (90s). George Sweeney's brother Ken was in Instant Party and is now better known as Setanta recording artist Brian. Recorded at Lombard Studios in October 1978. Single of the Week in Sounds. CD - SSA Records - SSA-003 - Spain - 2001?